The original Band Aid was a charity-induced supergroup founded in 1984 by Bob Geldof and Midge Ure. Geldof was the lead singer of the Boomtown Rats in the late 1970s and early 1980s, and Ure was the frontman of Ultravox. The celebrity musicians joined forces for a noble cause, and that was to raise money to fight hunger in Ethiopia. The release of the song “Do They Know It’s Christmas?” was the primary vehicle used to generate financial contributions. Band Aid became the catalyst for further celebrity-led media events. Emotional slogans, which helped convince people that challenging and complex problems could be solved by feel-good events, have given way to the hashtag campaigns of today’s social media. Ian Birrell, an expert on the African region, wrote in the Daily Mail that Band Aid, despite all of the sincerity on the part of the individuals involved, ended up doing more harm than good in Ethiopia. Birrell is putting forth the argument that Band Aid ended up contributing to the forced re-settlement policies pursued by the Marxist dictatorship in Ethiopia in the mid-1980s. Fans of Band Aid and its successor events were not informed that surplus food was available elsewhere in Ethiopia. Currently, the nation is implementing forced relocation of about 1.5 million people from their homes in a Stalin-style program. Ethiopia remains a repressive state that confiscates land, murders pro-democracy protesters, locks up dissidents, tortures political prisoners, sexually assaults women, jails journalists and uses food aid to create famine. Band Aid spawned counterparts in the United States. “We Are the World” was written by Michael Jackson and Lionel Richie, produced by Quincy Jones, and recorded in 1985 by a supergroup called USA for Africa. Live Aid, a dual-venue concert that took place in the summer of 1985, was also organized by Geldof and Ure in order to raise additional funds to provide relief to victims of Ethiopian famine. Questions surfaced about the money that was supposed to go to the starving people of Ethiopia. Fox News Channel host Bill O’Reilly reported that funds ended up being siphoned off for military use by Mengistu Haile Mariam, the Ethiopian head of the Derg, the Communist military junta that governed Ethiopia in the 1970s and 1980s. Some are wondering whether the new version of Band Aid will turn out to be like the original, falling short of its loftier goals. Time will tell, but doing something beats the alternative. 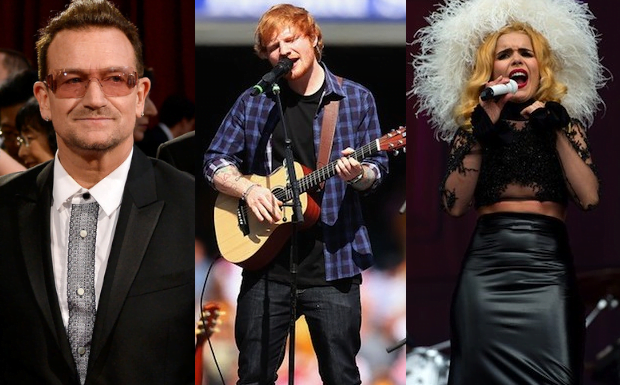 This entry was posted in Brave New World, Fundraising, Media Culture and tagged Bono,Chris Martin, Ed Sheeran, Ellie Goulding, Emeli Sande, One Direction, Rita Ora, Sam Smith. Bookmark the permalink. Both comments and trackbacks are currently closed.